From what originates your personal drive to contribute to a sustainable world? I had the good fortune to be exposed to the ideas of sustainability already in the late eighties. When I was appointed to be the chairman of the Dutch employers’ federation VNO, I became involved in the earliest efforts to mobilize the Dutch business community around this theme. It has lost none of its urgency. 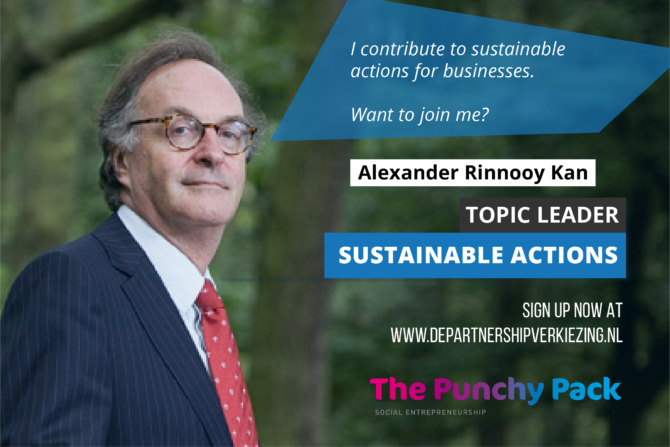 What is your role in taking action for increased sustainability by 2030? My current responsibilities are largely supervisory; I am also a member of the Dutch Senate. The main global targets are the circular economy and sustainable energy; the main tool is broad public-private collaboration. I am very encouraged by the progress that we are making. I am impressed by many, but especially by some of the Dutch multinationals which have seen the light. They have so much talent and so many resources at their disposal that they can really make a difference. What is the role and potential of young professionals in creating sustainable solutions? Young professionals represent contemporary know-how and timeless energy. They are the indispensable builders of a sustainable future. View it as a great opportunity to learn new things and make new friends, while contributing to the overriding global goal of the moment!